Quickly scan the desired frequency range in seconds allowing SWR adjustments quickly and easily. Both SWR and impedance measurements are provided simultaneously. Precision analog meter provides SWR/impedance changes in real time. A frequency sweep of the SWR will tell the user whether the antenna driven element being tested is too long or too short. 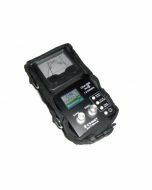 "The CAA-500 provides the most usable information in a concise and accurate manner, and is perfect for the typical amateur radio operator."